Sidney Slon/Pipe Dream Photographer Junior midfielder Alissa Franze registered two goals in the first half of Binghamton’s home opener against Niagara. 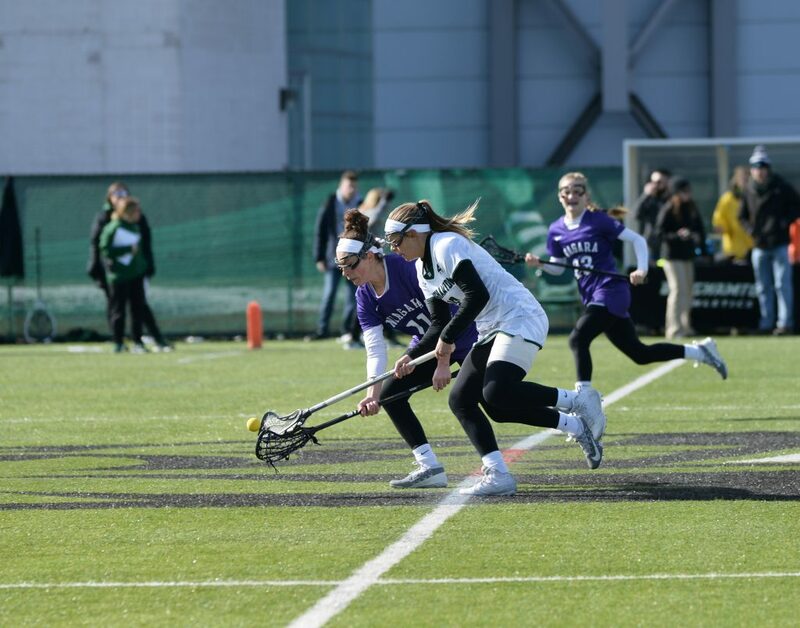 In its 2019 home opener, the Binghamton women’s lacrosse team put forth a good effort but faltered in the game’s final minutes. After a strong start, the Bearcats (0-2) were defeated 11-9 by the Niagara Purple Eagles. Two players came out of the gate hot for Binghamton. Junior midfielder Alissa Franze put the Bearcats on the board four minutes into the game and scored again 13 minutes later. Sophomore midfielder Kelly Quinn had a breakout game for the Bearcats. A few minutes after Franze’s first goal, Quinn bounced in a shot in front of the net, scoring her first career goal. After combining for four goals last season, Franze and Quinn scored BU’s first four goals of the game. Sophomore midfielder Alyssa Sanchez also had a solid performance, contributing Binghamton’s fifth goal of the game, the first of her career. She scored again in the second half. After facing off against Atlantic Coast Conference opponent Syracuse in its 2019 opener, Binghamton faced a more evenly matched opponent in Niagara (2-0). The team responded with a more balanced attack throughout the game. Junior goalie Taylor Passuello played another excellent game for BU. After recording a then-career-high 13 saves in the season opener against Syracuse, Passuello stopped 18 shots against a high-volume Niagara attack. Niagara did not take the lead until there were just over 11 minutes remaining in the game. The teams exchanged an additional goal each, and following a late equalizer by Binghamton, it was a new game at 9-9 with two minutes to go. Unfortunately for BU, the last two minutes were its most difficult stretch in the game. Niagara senior attacker Rachel MacCheyne scored her third goal of the game, giving the Purple Eagles a one-goal advantage. After the Bearcats lost the critical ensuing draw control, Niagara scored again, giving the Purple Eagles a comfortable two-goal lead with 31 seconds remaining in what ended as an 11-9 victory for the team. This year’s Binghamton team is vastly different from last year’s, with several starters who hardly played last season. Both Quinn and Sanchez played sparingly last season, yet both posted multiple goals yesterday. The team is still gelling together early in the nonconference season. Binghamton will hit the road for its next matchup against Colgate Wednesday night. Faceoff is set for 5 p.m. from Beyer-Small ’76 Field in Hamilton, New York.